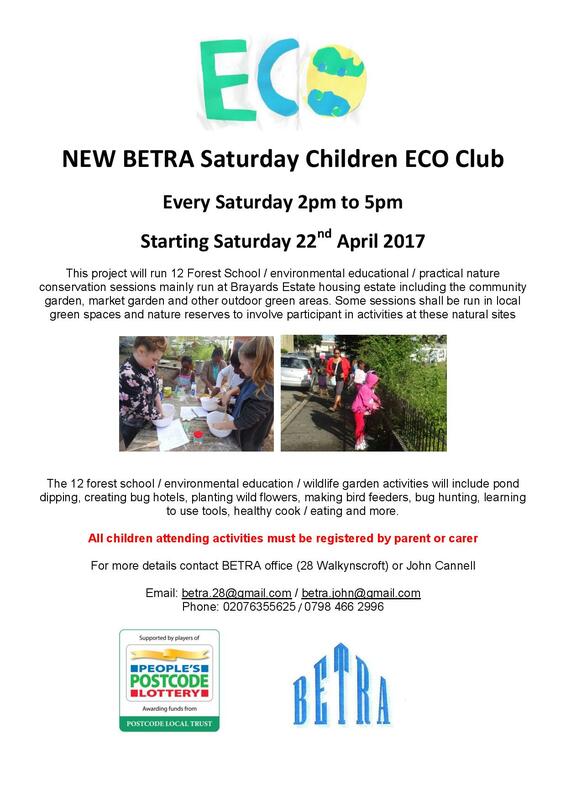 This project will run 12 Forest School / environmental educational / practical nature conservation sessions mainly run at Brayards Estate housing estate including the community garden, market garden and other outdoor green areas. Some sessions shall be run in local green spaces and nature reserves to involve participant in activities at thes natural sites. Project activities shall be run by experienced freelance forest school / environmental education / nature conservation tutors. The 12 forest school / environmental education / wildlife garden activities such as pond dipping, creating bug hotels, planting wild flowers, making bird feeders, bug hunting, learning to use tools, healthy cook / eating and more. All these activities shall teach children about their local wildlife and also help to increase the local area's wildlife biodiversity. Some activities shall either help improve or maintain the estate's wildlife habits these shall including planting native tree, pruning wildlife hedge and planting wildflowers around the estate. All the project activities will be healthy activities that build community spirit & give participants a sense of pride in their local green spaces.